When we are at home, in a cabin or a fixed camp, we can use full-sized bench stones to sharpen our cutting tools. When we are on the move, however, we do not want to be carrying full-sized stones. They have a similar density to bricks. Even a full-sized combination stone, which would provide a couple of different grades at least, is going to be too heavy for most self-propelled trips. Equally, we need to keep our tools sharp on the trail. When you are planning a trip, you should select all of your equipment carefully. 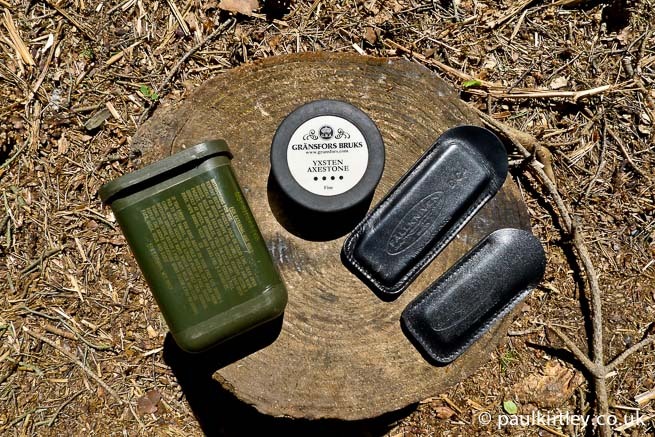 Unlike just heading for a stroll for the day or a weekend camp in your local woods, a multi-day journey requires more discipline in your kit choices. The discipline normally comes down to leaving things out. Packing things “just in case”, is a common trait amongst outdoors people, particularly relative novices. For those who are used to using cutting tools, one of the hardest decisions can be which tool or tools to take and which to leave behind. Ultimately, if you are objective, the trip you are planning will easily dictate the tool requirements. List the capabilities you need individually and as a group. Research what you will be allowed and/or required to do in the area you will be visiting. Do you need an axe and a bucksaw? If you do, how many do you need in the group? Will you be using axes on a daily basis or just occasionally? Do you really need one tool each or just a few amongst the group? Will fixed blade knives and folding saws be sufficient? Is having a knife on your person important for safety, such as when canoeing? Do the rules of where you are going mean you cannot cut green material? Will there be a fire ban? Question even whether you need a fixed bladed knife and/or folding saw. Will a locking folder be enough? Or a Swiss Army Knife with a small saw as well as a locking blade? Are you carrying a large, heavy survival knife in case of emergencies when a smaller knife and a folding saw would be a lighter weight and more versatile option? Hiking with a tent and a stove in the hills puts different demands on your cutting tools to hiking in a forested area with a tarp and relying on fires for cooking. If you are winter camping with a heated tent, you will need to source and process a significant amount of firewood on a daily basis. You will need an axe and a bucksaw or bow saw. In a larger group, you might need a couple of saws and several axes. On a summer canoe journey in the same area, however, your need for firewood will be much lower but you may have to clear portage trails. The point is to think about why you need the tools and choose accordingly. Once you know which tools you need to take, how many of each tool will be carried by your group and how frequently they will be used and, therefore, how often they’ll need to be sharpened, you can choose the sharpening stones you need to complement them. You have two basic choices – to buy a dedicated “travel stone” or “pocket stone”, which was designed/manufactured with portability in mind, or to create your own from a larger bench stone. There are many pocket sharpening stones and whetstones on the market. Many modern pocket stones have a diamond compound as their abrasive surface. Diamond stones are excellent for removing metal and shaping a bevel quickly. They also have the benefit that they need no lubricant – oil or water – as you do with other types of stone. This means less mess – both in using the stone and storing it, for example in your pocket or in a pouch with other small items of kit. All you need to do is clean the surface of the stone occasionally. The downside of pocket stones in general is their small size; you have to modify your sharpening technique compared to your bench stones at home and, depending on how you use them, you have to be mindful of not cutting yourself as your fingers can be much closer to the cutting edge while using them. In the case of diamond pocket stones in particular, the edge most of them create is not particularly fine. That’s the flip side of their abrasiveness. You can get finer diamond stones but then have to carry at least a couple to have coarse and fine grades. An alternative is to carry a stone which combines diamond with a ceramic surface. Ceramic stones can create very fine finishes but the downside is that they remove metal very slowly. Hence, a combination of the diamond surface, which removes metal quickly, and the ceramic surface, which refines the edge is a good one. This is the combination I prefer. 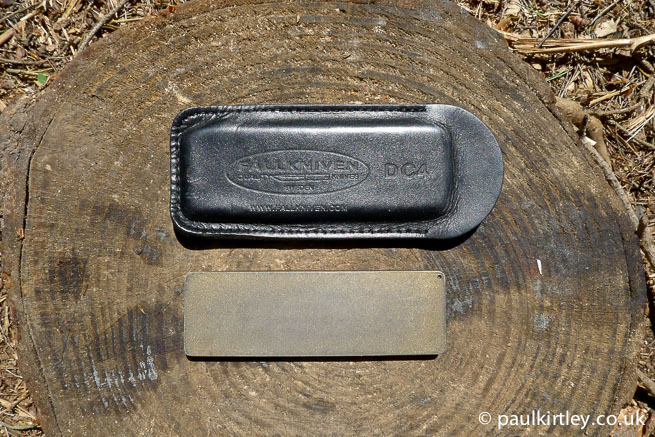 There are two stones made by Fällkniven which deliver this combination very well the diminutive DC3 and somewhat larger DC4. I mostly use the Fällkniven DC4. It works well for small fixed-bladed knives – what many would term a “bushcraft knife” – as well as locking folders and smaller folders. It can also be employed in sharpening an axe very effectively. This is my pocket stone of choice and I automatically take it whenever I take my main belt knife. The stone looks smaller than it is. It’s pretty much exactly half the length of a typical bench stone. This surprises many people. Admittedly, it’s also narrower and thinner which is, I think, what gives the impression of it having less effective surface area than it actually does. Lastly, the stone comes with a nice leather slip case. The smaller Fällkniven DC3 is made of the same materials (and comes with a smaller leather slip case). I find it too small for effective day-to-day sharpening for my main belt knife. Of course it could be employed in an emergency. Out of choice, though, I carry the DC4. If, however, I’m carrying only a folding knife then the DC3 is the stone I consider first. The DC3 is smaller and lighter than the DC4 – an option for when weight/space is at a premium but you still the ability to sharpen. Photo: Paul Kirtley. A typical scenario would be a backpacking trip in the Scottish Highlands, where I’ll be in open country much of the time, as well as using a stove rather than relying on a fire. Weight is always a key consideration when hiking any distance. I’ll typically take a Swiss Army Knife (only) and there won’t be much opportunity/reason to use it, certainly no significant opportunity for woodcraft. If I’d still like the ability to sharpen my knife during the trip, the DC3 is perfect for this scenario. The stone is light (less than 50g without the slip case) and effective for creating a very good edge on smaller knives. Designed to be a stone primarily for sharpening axes, these squat, cylindrical hockey puck-shaped stones can also be employed effectively to sharpen your belt knife. On trips where I will be using my axe quite heavily – such as a winter camping trip with a heated tent – then this will be my in my kit bag (along with an axe file). I may still carry the DC4 in my pocket, which serves as a back-up. Gränsfors Bruk who have for many years produced these stones from natural materials, now produce a synthetic version of the stone too. I use the original version, which is made of natural stone from Gotland. I’ve owned and used it for many years and it will probably outlast me. These stones can be used dry but are better used with water (like a Japanese waterstone). They can also be used with oil (like an Arkansas stone) but once you’ve started to use oil, you must continue with it. Hence, I’ve always used water as it’s easy to come by on the trail (compared to oil) and means you don’t need to carry small bottles of oil. It’s worth bearing in mind, however, the downside of using a water-based sharpening system in cold environments is that they can crack if allowed to freeze while still permeated with water. These stones are a combination stone, with two grits. The fine grit is not as fine as the ceramic on the DC4 – this makes combining the DC4 and Gränsfors axe stone also a good idea from the perspective of creating a 3- or 4-stage sharpening process with the DC4 diamond surface being most aggressive and the ceramic surface being the finest, least aggressive surface; the two grades of my original Gränsfors axe stone sit nicely in between. The axe stone comes with a rubberised case which is very good for protecting the stone from knocks. As we’ve seen above with the DC4, an effective travel stone for belt knives is half the length of a full-sized bench stone. We’ve also seen from the Gränsfors axe stone that a smaller stone which can be held in the hand and applied to an axe is a very effective solution. In fact, a shorter stone is a more effective solution for sharpening an axe than a full-sized bench stone. This is because the length of a full-sized stone causes it to come into contact with the cheek of the axe (unless you only use half the surface of the stone). This is because the contact between stone and axe cheek interferes with attaining the angles required to take metal off the whole convex bevel of the axe. So there is no advantage to using a full-sized stone. A smaller stone is just as effective and more wieldy. So, one option is for you to create a half-length stone which will sharpen both your knife and your axe. You can do this simply by taking a combination Japanese waterstone (1000/6000 works well) and sawing it in half. This is also quite economical as the stones are not particularly expensive and you can create a travel stone for a friend in the process too (or two for a larger group travelling together). 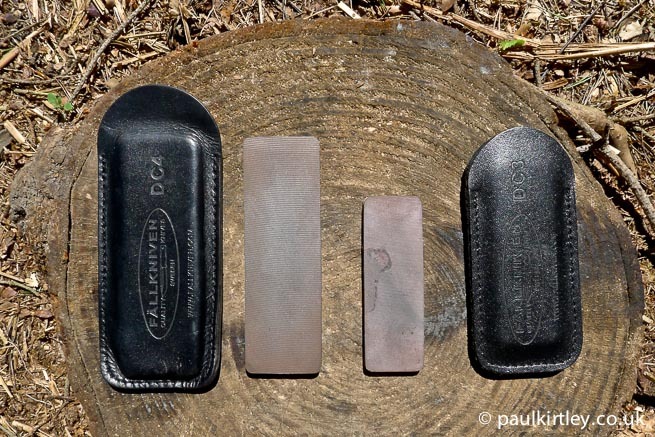 The resultant halved combination stone is a very effective stone for sharpening your knives (it’s the nearest to a bench stone of any of the options shown here) and works very well on an axe, applied in the same way as a puck-style stone. The downside is that it’s also the heaviest in weight of the options shown in this article. Half a Japanese waterstone, cut down for travel and ease of use on an axe. Photo: Paul Kirtley. If you are going to cut one of these stones manually with a hacksaw, then make sure you use better quality blades made of high-speed steel, otherwise the saw teeth will quickly become blunt and before long be removed completely! The finer side of these stones are soft and prone to damage of the surface as well as the corners being chipped off. You, therefore, also need to provide some sort of protective case. A small food storage box works well. 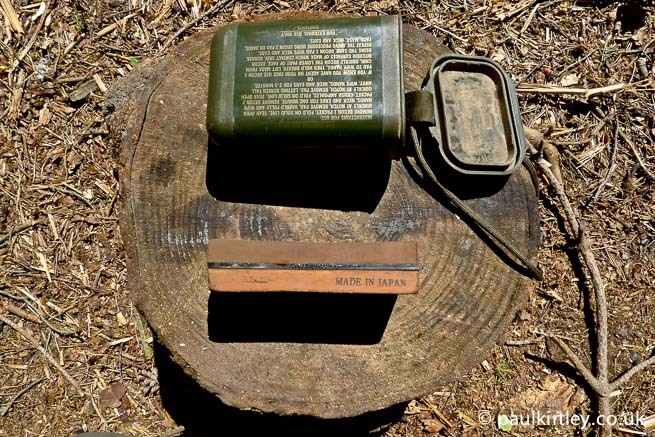 We’ve also found surplus US military decontamination kit containers (as shown in the photo above) are the perfect size to house one of these stones. These are the travel stone options I have in my kit drawer for sharpening the main cutting tools I might use on a journey. As mentioned above for trips where an axe is very important, I take a file for remedying any chips. For tools such as spoon knives and crooked knives, I might consider more specialist, shaped sharpening stones. These I will cover in a future article. There are many sharpening stone options on the market. I’d be interested to hear about what you use and under which circumstances. Let me and other readers know in the comments section below. Nice article Paul. I use the DC4 as well and find it’s a good stone once you’ve used it a few times to smooth the aggressive cut of the diamond side out. I’ve also got a cut down 1000/6000 water stone but mine’s quartered so it’s about the same size as the dc4 and it’s quite nice to have instead as an alternative. I actually cheated and bought mine pre-cut from Dave Budd. I believe he cuts them down on a floor tile cutter with a diamond stone cutting blade 🙂 He’s still selling them if you’re interested. ER! Yes! Let’s just go with that! 😛 LOL! I use a “Worksharp” It has rough and smooth diamond sides, a course, fine and fish hook ceramic rod (Twist to choose!) and a leather strop on the other edge. About 20cm (ISH!) and I tied a paracord toggle to keep a good firm grasp on it. Brought a new lease of life to my “Swiss Army” knife, and a quick strop on my “Mora” to keep the edge. Happier than a pig out in the woods! 😀 Have a good one! I too use the DC 4 or DC 3, but I also take a selfmade strop (old leather belt glued on a piece of wood), with a bit of compound on it. I tend to strop the knife every evening after it has had some use during the day. It seems like I don’t even need to retouch the edge, it just stays shaving sharp by only using the strop. It weighs about the same as the DC4 and DC3 combined. I use the DC 3 to retouch my axe now and a while. The old Fällkniven DC3/4s are great stones. Fällkniven’s manufacturer has since changed and they’re no where near as good now, I find. They’re much rougher and don’t sharpen to as fine a edge. You can tell the old stones apart from the new as the old have a brown ceramic side, rather than a black carborundum one. Because of this (after giving away my old DC4) I’ve switched to a Spyderco “Double Stuff”. I highly recommend it. I love the idea of bringing a sawn-in-half waterstone, but with the water requirement plus the weight I think I’ll stick with little ceramic stones that need no lubrication. I love using waterstones at home though. I really appreciated your comment as I have been unhappy with the quality of my (relatively new) DC4 too. Can you suggest where I might get hold of a Spyderco Double Stuff? Thanks again for your very useful remarks. Hi! No problem, I was quite frustrated also. You can get the Double Stuff from Heinnie Haynes if you’re in the UK or Europe. If you’re in the US they’re everywhere, Amazon, Spyderco themselves etc. That’s brilliant, I’ll get one ordered. Really appreciate you getting back to me. Good to see you guys offering each other advice too. I’m going to try one of these too. I have the Spyderco ceramic rods and they are very good. I will have to try one of the Spyderco stones. There are quite a few votes in favour of it here. My DC4 stones (I have a couple) and DC3 are older models and have served me very well. Interesting feedback on the new ones though. The half waterstone can be a useful group sharpening option for snowshoe/hot-tent trips as well as canoe trips, in addition to having a small stone on your person. Hi Paul. If you have the Spyderco Sharpmaker rods (I have them too, they’re great!) then you should like the Double Stuff just as much! It’s the exact same ceramic/grit. It’s longer than the Fällkniven DC4, yet narrower. I should probably warn people though that it doesn’t remove steel that quickly. It’s perfect for keeping a somewhat sharp knife shaving-sharp, but don’t expect to do any re-profiling or removing dings with it. Hi Paul. If you like the Spyderco Sharpmaker rods (I have them too, they’re great!) then you should like the Double Stuff just as much! It’s the exact same ceramic/grit. It’s longer than the Fällkniven DC4, yet narrower. I meant to say I really want one of those Gränsfors stones! Apparently Gotland is starting to run low on the natural sandstone it’s made from so they’re becoming harder to find. Grab ’em while you can! They make ceramic ones now that they claim have similar properties but there’s just something satisfying about using natural products/materials. Thanks Nathan, I’ll give a DS stone a try then I think. I agree the DS is a little expensive. Perhaps £20-25 would be more like it. All of Spyderco’s ceramics are proprietary and made in-house in the USA though, where’s Fällkniven’s DC3/4 are made in China. Not that’s necessarily a bad thing, but it explains the extra cost. Thanks for the response mate. I have found that the “New” DC does need some working in to get that razor edge but even when using new if you do a good bit of work with a strop I have been able to get my scandi grind hair shaving sharp. My wife always complains cause I have random patches of hair missing on my arm!! I just say its woodsmans alopecia…. That’s a neat solution for carrying your DC4. I’m not a huge fan of the Quick Fix but I agree it will work pretty well to keep a SAK in shape. Hi Paul, won’t need to sharpen my SAK anymore, just got confiscated in Dubai airport, threw it in my pack after moving house and forgot it was there, worryingly I got through three security checks and a flight before it was discovered in the transit arrivals oooooops! I’ve carried a dc4 and strop for quite a few years now but just recently I bought a new system to try out. It comprises of two miniature size combination Japanese water stones, one stone has a coarse side and a medium side and the other stone a medium and a fine side, these are housed in a watertight plastic case along with some non slip matting. I’ve not had a chance to try them out yet but the kit isn’t too big to slip in a bag and it doesn’t weigh too much. I’ll let you know how I get on with them when I’ve used them. I will indeed be very interested to hear how you get on with your mini-waterstone kit. I tried out the new stones this morning on a very blunt old Mora clipper. As the knife didn’t have any chips in it I skipped the coarse stone and just worked with the medium and fine sides, after about 15-20 minutes on the stones and then a quick strop the Mora was scarily sharp. I’m still going to keep my dc4 in my pocket but this new kit has definitely earned a permanent place in my bushcraft bag. I’ll bring the kit to the bushcraft show in may if you want to give it a try. Sounds like a very promising set-up James. I look forward to taking a closer look in May! I have used a DC4 along with the leather belt that holds my trousers up, on both my “belt knife ” and my Leatherman PST for years, simple, easy. Hi Mark, yes that’s a very straightforward but very effective combo. Great article Paul. In the field I use small stones as you discuss. At home I use the “Wicked Edge” sharpening system which will put a mirror edge on the knife which you can see your reflection in. It is so sharp after using this system that just the weight of a human hair will sever the hair. After using this system and a premier blade of steel the edge will last a long time unless abused as we sometimes have to do in the field then outcomes the pocket stone. How do you find the Wicked Edge system gets on with knives with single, flat bevels such as Moras or typical “bushcraft” knives? I use the DC3 both outdoors and at home. I find it good for sharpening both knives and axes. The diamond side is abrasive enough to remove large chips, so I don’t need to carry a file for a properly profiled axe, and the ceramic side puts a shaving sharp edge. I agree that the DC4 is more comfortable to use, but I opt for the weight savings. I use the same stone at home so that I always use the same technique, and know exactly how things are going to work when I’m in the woods. Thanks for sharing your thoughts Ross. It is surprising how fine an edge a Gransfors axe will hold and how achievable a razor edge is by using the ceramic side of the DC stones. 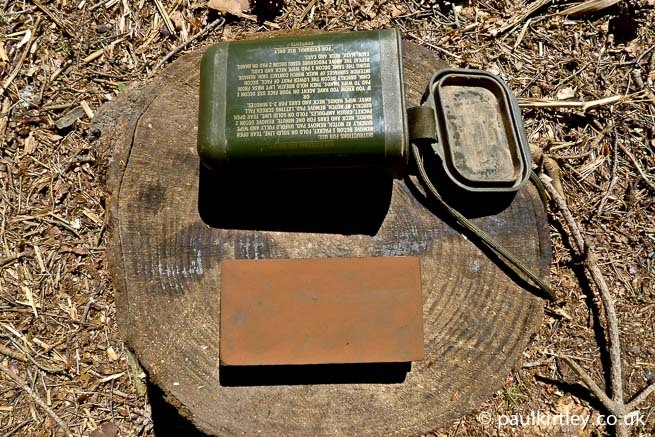 You also illustrate a good point – that even if you do use bench stones at home, you should familiarise yourself with your field sharpening kit before you head out with it. This is important if you want to use your knife for long periods when out and about. At home a good Japanese Waterstone is a good choice, but they can be high maintenance, and work best with another stone to create the slurry which does the sharpening. Out and about I use a combination of a small ceramic stone, about 8mm diameter which i rub on the blade every so often just to maintain the edge. If the edge needs a bit more work or I have nicked it in some way, I use a credit card sized diamond lap. Neither ocf these will replace the waterstone at home but when you are out and about hopefully its more about the maintenance of the edge and not the creation of the edge. Thanks Bill. Yes, it’s interesting to see the different systems people use out and about as well as at home. And just to re-iterate your point – you definitely need a nagura stone to get the best out of your finer waterstones back at home. Thanks for sharing Paul. I have these stones and they are great to carry in the bush. I recently discovered the Work Sharp Guided Field Sharpener and Its fantastic sharpener. It’s so good I went back and bought another 🙂 I encourage you to check it out. Let me know what you think. Thanks for adding this info. I’m not familiar with that sharpener so I’ll have to check it out. Great article, I love the DC stones. I have tried most things from waterstones to wet & dry on a mouse mat and I have not been able to beat these for both convex and scandi grinds. Interestingly, I know they have had mixed reviews in regards to quality, but I have had both the old and the new stones and I find the new ones to be better. I have even invested in the large bench stone. I like the fact you can use them without anything else being needed and they are always flat and level. With the addition of a strop I find you can produce a shaving edge very quickly with very little fuss. Excellent tools. Thanks for your comment. Interesting counterview in the more recent DCs. Also interesting you use the larger bench version. I’ve always used the same at home and away, a dc3, an Arkansas whetstone and a very small U.S. army issue stone on a keyring and the good leather belt I wear to hold me trousers up, at home now and again I do use fine wet and dry paper wrapped around a oil stone and some cutting paste on a leather strop, works for me. I carry a DC3 everywhere I go. For seriously sharp edges I use the spyderco double stuff, it is a better (bigger & finer) tool. Just not as affordable. That combined with a bit of smurf poo loaded into your belt will put a razor edge on anything! I have experimented with the little dog bone style key ring sharpeners. The best thing to do with them is to pull the rubber or plastic bits off of the ends and throw them away! The caps rob too much of the precious length of the stone. But otherwise the wee things are also very good. Especially if you use knives with serrated edges. Anything with a carbide or “V” shaped widget is a crime against humanity! The purveyors of these things should be burnt at the stake! Thanks for your comment. More good words for the “double stuff” I see. I sometimes carry the Mors Kochsnski style “plywood with wet/dry paper” sharperner. Light and easy to work with. And I have treated the inside of a belt with a sharpening paste so that I can strop the knife. But both the DC4 and the Gränsfors bruks stone are nice. Hi Pär, yes the Mors method is a good alternative. Great article. I now use micro mesh a lot. I find if you wrap it round a piece of ply with some heavy duty rubber bands it makes an extremely effective sharpening system. I go through all the grades (they weigh very little) in a stropping action. This is not a substitute for bench stones, but in addition to bench stones. It works well in the field too, especially when coupled with some courser wet and dry paper. I also use a hard backed leather strop with some carborundum powder. Works a treat. It’s good to hear from you. That’s an interesting solution with the micro mesh and not one anybody else has mentioned so far. Thanks for sharing. I have been using DMT Diafold stones for about 15 years and love them. Each one has two sides and the plastic handles fold over to protect them even though they are tough as nails. They weigh next to nothing and are small. Amazon has the best deal on them. I have three of them, coarse/fine, fine/extra fine, and extra fine/extra extra fine. They do have extra coarse grits as well and will get one of those soon. I know people who swear by their full set of these stones. Taking a full set on the trail always seemed overkill to me. Is there one which you think would be the best overall choice for carrying if you could only take one? Thanks for the fast response. If I could only take one it would be the coarse/fine one as it would be the best combo for being able to re-profile an edge and put a decent edge on as well, although not the super shaving sharp edge like most of us like. These little hand ones are really so light and small that you could take two like usually do. I also take the fine/extra-fine one and this allows me to put a little sharper edge on. I have used them both dry and wet but usually use a little water with them. I highly recommend giving them a try to see what you think. I use them for all of my tools including my axe and even to touch up the saw teeth. 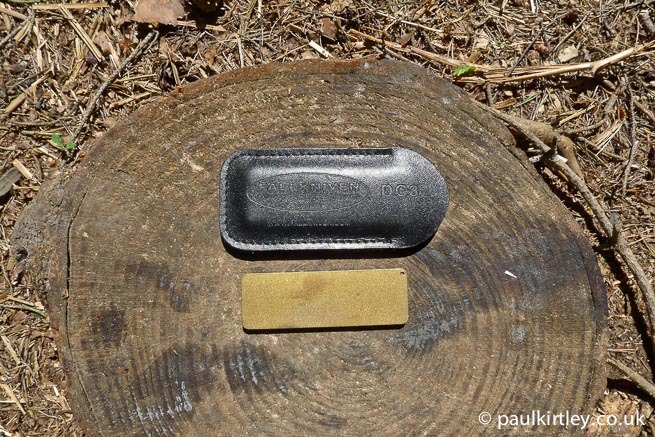 Hi Paul for years now I have been using the DMT sharpening stones with no problems in the field I carry a course DMT with foldable handles which is now rather smooth but still works a treat and I also carry a pen sized steel which is housed in its own handle and I have used them to sharpen my clasp knife, SAK to my fixed blade knife if I am carrying a machete I also have a chainsaw file and half a boat stone, which I also use when at home, I might consider getting a decent bench stone for use at home. Hi Odin, thanks for your comment. Thanks for your message. It’s good to hear about your experiences, particularly with the DC4. Always useful to have in your pocket. it might also be worth pointing out that the diamond plates from a DC3 or 4 can be bought without the nasty new style stone bit. and they’re pretty inexpensive too. a diamond plate from a DC4 (or a fallkniven DF24 wee diamond file thingy) combined with the spyderco double stuff is an excellent combo. That’s a very good point Andrew. Thanks for highlighting this. Like others I have been very unhappy with the newest line of DC4 and DC3 stones from Fallkniven. I used to have an older one but lost it on a backpacking trip. At the time it didn’t seem like a big deal, I just went on amazon and purchased a new one. However the new one is no where near as good of a stone. The diamond coating came off quickly and the fine stone was much more coarse. Since then I have tried everything from the Double Stuff to the DMT Diafold. All of them have been rather unsatisfying for one reason or another. The Double Stuff is great for touchups but really lacks when there is any damage to the edge, where the Diafold I found to be very awkward and left the edge extremely toothy, even with the fine sides. The system I use now I am not 100% satisfied with either, however I feel it is the lesser of the evils. I currently use two Arkansas stones that are 4″ x 1.7″ x 0.5″. One is a Washita and the other is a Hard Akansas stone. The Washita is about a 400 grit equivalent and the Hard is about an 800 grit equivalent. I haven’t decided if the slight bit of extra weight is worth it but I have had really good success with the Washita and Hard Arkansas combo. I feel like I get a much more refined edge after using the Hard Arkansas than I do even with the Double Stuff. This could just be my brain playing tricks on me though. Either way, I just wanted to give my story of my field sharpening struggles. I am a new reader to this blog and am already a huge fan of your unbiased and utilitarian look at gear and skills. Thanks for the quality read! I’m pretty pleased to find this website. I need to to thank you for your time for this wonderful read!! I’ve glued a diamond stone to the underside of my fixed blade knife sheath and like to carry a small ceramic rod. One thing I found useful is a mini chefs steel, just to give that extra bit of bite to my blades. (No need for a car window) Its around 4″ long and sits nicely down the side of a DC4 slip case so always to hand. Thanks for the great article, keep them coming. This combination gets my hultafors sharp enough to shave with, so it does the job. Another voice for the double stuff. I also have the new DC3 although I am disappointed with the fine stone I do find that the diamond is good for the big dinks in my blade. The DS gives a great edge that I Finnish off with a leather belt. I love the belt, it holds my trousers up, keeps important things close and sharpens. Multi tasking at its best. Thanks for your comment and the vote for the DS. What is smurf poo and where the hell I’m I supposed to buy it? Is it from that online shop that sells Guatemalan licking toads and Peruvian insanity mushrooms. Ps do you mean lapping compound? smurf poo in this instance is starkie sharp blue, this stuff. no commercial affliation blah blah. but it is excellent stuff. very interesting article as usual…. From my side I mostly love convex edge knives (I have F1 falkniven knife) thanks the easy to sharpening these type of edge in the bush with sandpaper up 2000 graded and bark river black green and sometimes White compounds. For some finer work like feathersticking, sometimes I use a mora knife. I also have other knives purchased with V edge that I have convexed too. Regarding sharpening V edge knives, in my opinion the best way is japanese waterstones, with them you can finish with a wonderful and superb edge. Naturally, it is impossible to bring with me these kind of stones out there so in that case I normally use a DC4 stone, but personally I don’t like it so much; to small for a good job. 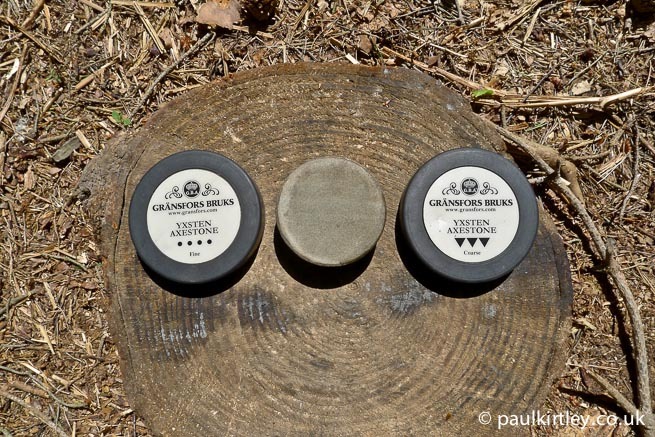 As for sharpening axe I like gransfors puck stone folowed with the ceramic side of dc4 stone but some time, also I proceed straight with sandpaper and bark river black compound. Very important is understand the type of steel we have at hand because not of all can keep a very finest sharpening grit. Thank you very much for sharing your articles and best reagards. Thanks for your detailed comment. It seems we are pretty much on the same page with respect the Gransfors puck. The bevel profile on the PK1 Wilderness Knife is somewhat convex due to the way that Simon hand-finishes them and I have grown to like this (and preserve it) rather than trying to flatten it. I still use waterstones at home though and get a fantastic edge. It’s a very different profile to the F1 though, which is a fine knife. My view, though, is that a good part of the edge retention comes from the 3G powder steel, which holds an edge very well. Thanks also for sharing your thoughts and methods – much appreciated. The Worksharp Field Sharpener works great. It has guides to help with the angles. at home I´m using the spyderco sharpmaker to keeping the edge of my knives in good shape. If the knife is dull, I´m using the Lansky set. After this I´m using a polish-mashine. On tour I´m using a LAP Stone. It´s a thin stainless steel stripe, one side with a course and the other side with a fine diamond coating. Works well on knives and axes and it´s very lightweight. Thanks for sharing your articles, I´ve learned a lot. Hi Baz, glad you found this useful. Let me know how you get on with the cut-down waterstone idea. Hi Paul i read one of the comments where it said that i think it was dave budd cut stones with a tile cutter and as i have one of these i bought a diamond cutter it cut my stone perfectly, so thank you so much for your blogs because with out them we would all be in the dark.atb,Baz. And you are very welcome with regards to my blogs. When I pack my bergen I put in it a Lansky sharpener that has two blades which will give an emerency sharpen and reset the blade just while I am in the field. At home I use the Lansky sharpening system which has a rough then medium and finally a fine grind. I then finish off the sharpening by running the knife/whatever over some ceramic. The back of a ceramic plate works fine. This usually makes the blade very sharp and robust, ready for the next use. Hi Paul: I say whatever floats your boat. I like to carry sharp tools but tend to have a minimalist approach. You can find a rock to sharpen a tool on in Oregon. This type of rod stone is very portable. http://www.extremely-sharp.com/diamond-sharpening-rod-knives-hooks-etc…..html I use it on my draw knives and crooked knives too. It can even be used like a file on a saw or axe. This may be a little overkill to pack on a canoe adventure but the adventure was to find a paddle in a driftwood log. I couldn’t agree more that you have to find what works for you. I use a Smith’s Pocket Pal. It has a diamond coated rod for serrated blades, both carbide and ceramic slots. Does not require water or oil and best of all it weights a grand total of 9 gm. I have a full width whetstone that is about 7mm thick and is built around a plastic frame. I can’t remember its brand right now, as its packed away. It’s light and fits into my kit very easily. Lansky have a diamond sharpening stone about a credit card size available in different grits – I carry the fine grade in my wallet, which is ideal for honing an edge on the pocket knife / EDC, although pretty much useless if you have not kept the blade reasonable sharp in the first place. I have stuck a piece of 600 wet-n-dry on the back, which does two things: easier to hold and can be used to put an initial edge on the blade. Many thanks to the new useful advice. I can tell that I achieve good results. Please make a video how to right sharpen the ax and hatchet. What about sharpening a knife with natural materials, like a river stone? I guess this is the way our ancestors sharpened their knifes and axes. Sure, some natural stones work well. Indeed the first sharpening stones were quarried. Another great article. I use Japanese waterstones for home use, when away from home I carry 3 grades of wet n dry emery paper 600/1000/1200. I can always find something to wrap these around and achieve great results for nearly zero weight. Keep sharing your amazing wealth of knowledge. It turns out that fallkniven have released a CC4, so this has two ceramic sides. It’s not as fine as a spyderco double stuff, but much cheaper. Good tool at a good price. And you can still combine it with a standalone diamond plate. Thanks for the heads-up Andrew. I too have a DC4 but found that the diamond side soon wore off and so was not as effective as it should be. I think cutting down a waterstone is a useful idea or maybe I’ll try the Spyderco Double Stuff. Wonderful article Paul and your efforts are much appreciated! Thanks very much once again for taking the time to explain everything in much more detail than anyone else has! not many people use we and dry paper. i was always a stone man until tried wet and dry and have never looked back , you can chose from 320 up to 2000 very cheaply and cope with edges from scandy to convex just by changing the base type ( thin foam for convex or MDF for scandy). i use a enzo burk 75 folder with flat grind and fallkniven f1 3g flat grind with convex edge. both are done on wet and dry and stroped on leather bonded on MDF with flexi cut supper gold stropping compound. in the field i just take the supper gold compound and rub on a ash branch to use as strop or western red ceder bark witch is quite abrasive by its self. smurf poooooo works just as well but is slightly harder and wet and dry ways nothing at all. I’m the same as Robert. Ripped up some MDF. One has 400/650 grit glued on either side. The other has 1200/2500 grit the same. Approx 8″x2″ but weighs nothing!! A fair while back I bought a DMT guided sharpening system from http://www.starkiesharp.com/. I’m not sure I’d recommend that as a field sharpening system for a scandi grind because it’s probably overkill but the DMT diamond stones are very nice and portable for someone with the necessary skill to use them freehand. I’m not sure how it was included but I also have one of their 7 x 3 honing leathers (I think) and starkie sharp blue compound and that does put a lovely polished shine on an edge and avoids the need to take your belt off :-). I’m sure you could improvise similar I just mention the Sharkie option as something readily available. No link to Sharkie other than being a satisfied customer. I was just wondering if you could let me know where (in the UK) I can get one of the plastic containers, pictured above, for cut down waterstone storage. Search online for US decontamination containers, they’re available in loads of places. I’m really interested in Portable Sharpening Stones but my friend advises me to use the pull through manual since it suitable for outdoor activities more than that one. Do you think he right?